A bike rack is the best way to transport your bike with your car. You can hook it up to the trunk and go. It’s better to use a bike rack if you don’t have one installed on the top of your car already. You can find a bike rack that will work for any bike and vehicle. This review will get you started on your research for the best bike rack. When it comes to finding the best bike rack, you want to consider the style you want. Roof racks are ideal for people who drive trucks or SUV’s, and the rack sits on top of the vehicle. Hitch mount racks come in two different styles. The tray hitch style support the bike on a tray and are easy to load. An arm support hitch mount has a low loading height and fits most bikes. 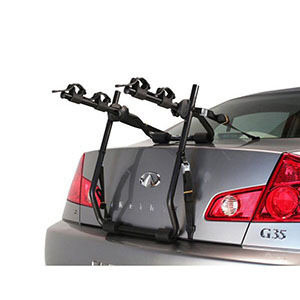 Trunk mounts are ideal for those who don’t want to put up with the hassle of other bike racks. They are secured to the vehicle with straps, and can hold various bike styles. The type of vehicle you drive will impact your decision on which bike rack is best for you. A taller vehicle, such as a truck or SUV, needs a bike rack that can hold the bikes steady in place. If you have a compact car, you need a bike rack that can hold the bike off the ground. If you drive a hatchback vehicle, a trunk mount will be the most beneficial for carrying your bike around. It all depends on the space your vehicle has, and what it can accommodate. Make sure you check this installation ﻿﻿guide. The bike’s frame plays a crucial role in the type of rack you’re going to get. A heavy bike can’t be held by a weak rack. The size and shapes of the bike will affect how the rack will hold it. While new styles of bikes are coming out every year, using the bike’s frame as a guideline won’t help too much, since some bikes aren’t compatible with certain racks. While most bike racks will support most bikes, there are going to be racks that won’t work with certain bikes. There are racks that include bike locks to prevent theft of your bike while it’s on the rack. Including locks on a bike rack can be more expensive upfront, but it will protect your bike and deter thieves. You want to make sure the bike can be locked up properly when it’s on the bike rack. Most bike racks included a locking hitch pin that keeps the rack hooked up to the vehicle. There are also fork mount roof racks that lock the bike in place while you’re driving. You can also use cable locks to help secure your bike to the rack to prevent accidents. There are plenty of bike racks that have different features to help haul any bike around. Security features, warranties, compatibility options, and tools for easy installation. You want to consider your needs to see what your bike rack needs before you get one. While there are some special features included with every bike rack, they may not apply to your needs. Understanding your bike will help you decide which features are a must-have, and what ones you can live without. You can make a checklist to see what’s important to you and your bike. This bike rack has the capability to hold multiple bikes. It’s ideal for families that love to take bike rides together. It secures to the trunk to ensure it’s completely locked in place. It can hold up to five bikes total. It is easy to hook up to a vehicle. There is a tool-free locking SpeedKnob that allows the user to hook the bike rack up quickly to the trunk of the vehicle. The rack locks onto the back of the vehicle to allow space in between bikes. It helps keeps the bikes in organized to allow a proper fit for every bike. The UpperHand lever tilts the rack down when the trunk is opened. It allows you to access the back of the vehicle. The rack also folds up for compact and easy storage. The ZipStrips helps secure the bikes to the racks when they’re placed on it. They’re fully removable for storing the rack away. The anti-sway cradles prevent the bikes from bumping into each other while driving. The bikes sit separately from each other to prevent scratching and damaging them. The bike rack will fit all 1.25 inch and 2-inch hitch receivers. It will fit on most vehicles with a hatchback. The Love it ‘Till You Leave It is a limited lifetime warranty that covers parts. If anything breaks on the bike rack, it may be eligible for replacement, at no extra cost. This is an excellent bike rack for those who have multiple bikes. It can store up to five bikes at once, depending on which one you get. It does appear to have a lot of plastic parts, which can break easily. It does fold up when the trunk is opened, which is a nice feature for a bike rack to have. If you can get it set up properly, it’s probably going to be the best bike rack for you. If you have a smaller vehicle, this is the perfect bike rack. It fits over the top of the trunk, and keeps the bikes away from the vehicle. It’s preassembled, making it easy to install on your vehicle. There are straps that secure the rack to the vehicle. It can hold up to two bikes at once, and fits most vehicles. It won’t damage your vehicles when it’s installed. There are easy to use adjustment hubs for fitting on the back of any vehicle. The four attachment straps ensure the racks stays secure on your vehicle. The straps make it easy to put the rack on and take it off. The rack is completely assembled already. Once it’s out of the box, the straps need to be hooked up. It’s easy to install on any vehicle, and won’t take too much time getting set up. The bike rack is large enough to hold up to two bikes at once. Since it attaches to the trunk, the bikes are set far enough away, the paint won’t get scratched. The bikes stay securely in place once they’re on the bike rack. The integrated tie-down straps add security to keep your bikes in place. There are soft rubber cradles that keeps the paint from getting scratched. The bikes won’t knock into one another when they’re secured in the cradles. The bike rack does include a limited lifetime warranty on parts. If any parts break while the rack is in use, they may be covered by the warranty. The bike rack should fit most vehicles, but a quick check will help you decide if it’s the right fit for your vehicle. This bike rack is the best one, if you have the right vehicle. You need a bike rack that won’t scratch the bikes or the vehicle. It’s perfect how the rack keeps the bikes away from the trunk of the vehicle. It is durable enough to hold up to three bikes. If you have a customized bike, you may want to look for a better bike rack that will hold it. This bike rack fits on most hitches to keep your bikes away from your vehicle. The patented tie-down system keeps the bikes secure. The arms can collapse when the rack isn’t being used for preventing bumping into them. The rack is made from solid steel to provide durability against the elements. The bike rack will hold up to three bikes on the arms. It attaches to a 1.25 inch or 2-inch trailer hitch for a secure fit for large vehicles. The arms reach out to 16 inches when they’re fully out. It allows the rack to hold up to three standard bikes. The bikes secure individually with the patented tie-down system to keep them secure. The arms collapse down when they’re not being used. It’s ideal for when the rack is still on the vehicle without the bikes. It prevents the arms from getting in the way of opening the trunk. The design of the rack is setup and install onto the back of the vehicle. It takes less than five minutes. Bikes are easy to get on and off the bike rack when the arms are extended. There is a lifetime warranty included with the bike rack. The sturdy steel construction makes the bike rack more durable than others. The black powder coat finish prevents the paint from getting scratched. If you’re looking for a durable and sturdy bike rack, this may be for you. While it may start to wobble while you’re driving fast, it does hold the bikes in place. The tie-downs provide extra security for holding them in place. The collapsible arms are ideal for when the bikes aren’t on the bike rack. It’s a solid piece of metal that won’t break easily, especially when there are bikes sitting on the rack. This bike rack can carry up to two bikes at the same time. It fits on 1.25 inch and 2-inch trailer hitches for easy access. The center arm can fold up when there isn’t a bike on the rack. If you have more than one person who loves to ride bikes, this is a great bike rack for transporting. The bike rack is capable of hauling two bikes on it. The design of the rack keeps the bikes away from the vehicle to prevent scratching the paint. The maximum capacity it can hold is up to 35 lbs. per bike. When there isn’t a bike on the rack, the center arm folds down to give you more space. The rack doesn’t need to be removed to access the trunk area of the vehicle. It only takes a few minutes to install the rack on the vehicle. The rack is easy to adjust. The upright ratcheting arms can be modified to fit any bike frame. It holds the bikes in place, and can be tightened or loosened for any bike frame. It accommodates bike frames up to 59 cm. The steel of the bike frame makes it one of the strongest bike frames available. It won’t rust or get scratched easily. The steel materials allow the rack to hold the heavier bikes easily. The limited lifetime warranty covers certain parts if they break. If any part gets broken, it may be protected under the warranty. The parts would be replaced at no extra cost. Holds up to 70 total lbs. This is one of the better bike racks available. It does everything a bike rack should do. Though it may pinch your fingers if you’re not paying attention, it shouldn’t deter you from getting it. It doesn’t wobble too much when you’re driving, which is ideal. The adjustable arm allows you to put two differently sized bikes on the rack. This bike rack ensures the bikes are protected with the soft rubber cradles. The arms can fold down when they’re not in use. You can access the trunk easily, and the rack is easy to install. It protects the trunk and hatch to prevent scratches. It has an anti-sway cage to prevent the bikes from swinging into the vehicle. The soft rubber cradles keep the bikes in place while you’re driving. They keep the bikes securely in place. The bikes won’t get scratched when they’re sitting in the cradles. The stay put anti-sway cage keeps the bikes from swinging around and hitting the vehicle while you’re driving. The bikes stay securely fit in the rack without disassembly. The bike rack has a patented system that makes it ideal for any vehicle. The FitDial allows the bike rack to fit on the back of a vehicle and out of the way. When there isn’t a bike on the rack, the arms fold down to keep them out of the way. The bike rack can hold up to three bikes at a time. When there’s only two bikes on the rack, the third arm can be folded up. The SoftCushion leg pads on the bike rack prevents the trunk from getting scratched. The pads are designed to hold the weight of the bikes without digging into the vehicle and causing damage to the trunk and hatch. This bike rack is a decent bike rack, and it works perfectly if you have a smaller vehicle. You can hold up to three bikes on the rack, making it ideal for people with multiple bikes. While the bike pedals may scratch the paint, this can be prevented by checking the pedals. Properly securing the bikes can prevent a lot of damage. Bike racks are ideal for anyone who loves biking various trails in their area. Some trails can take longer to get to than others, but a good bike rack should be able to make the trip. If you’re looking for a good bike rack the Swagman XC Cross-Country 2-Bike Hitch Mount Rack is the perfect recommendation. It has everything you need to hook your bike up and go for a fun ride anywhere. It’s stable and doesn’t have too much swing in the wind while you’re driving.